The Southern Endeavour double is the 'mother ship' of our fleet. Its length, combined with a wider beam, allows for excellent stability and positive forward speed. This kayak is fitted with all our latest paddle rescue fitting, stainless steel towing bar and moulded in paddle holders at the front of each cockpit. Comfortable seats with adjustable backrests and foot brace, plus larger cockpits lend this kayak to be most suitable for any hire fleet situation. As well as sealed front and rear storage compartments, the Southern Endeavour has a central storage compartment with a large hatch opening to take plenty of gear for overnight trips. (Same as the rear hatch - 40cm x 30cm). This double also has two lifting handles on each side of the bow and stern, making it easier to manoeuvre on land during multi day expeditions. 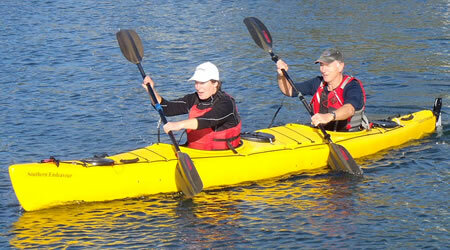 For a leisurely cruise or sea kayaking adventure, this kayak will safely take you to all those spectacular places. *NEWS FLASH* - Mission Kayaking have taken over manufacturing of our Swift, Penguin, Shearwater, Skua and Southern Endeavour + our recreation Strike. Contact details are on our homepage.